Avocados are most well-known for their place in our hearts and on our tables when game day rolls around… nothing beats a good guac. But, according to World’s Healthiest Foods, avocados are secret super foods with health benefits that go beyond vitamins and minerals. One cup of avocado provides a massive amount of vitamins and minerals that are recommended for daily intake by the National Institute of Health. This includes a whopping 26% of the recommended daily amount of vitamin K, which helps with protein synthesis, blood coagulation, and bone health. It also packs a punch of 20% of your daily-recommended folate, a vitamin that is key to cell growth and metabolism. Avocados also have 14% of the total daily recommended amount of potassium in one serving (that’s more than a banana!) and are high in fiber, both of which aid in heart health, digestion, and weight loss. Some people run the other way when they hear “high fat content”, but wait! 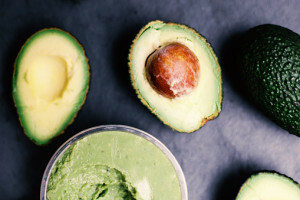 There are many different kinds of fats, and avocados? They have the good kind. Most of the fat in avocados comes from oleic acid (also found in olive oil), which is good for your heart, skin, and hair. These fats are also essential in helping you absorb higher rates of the nutrients found in other plant foods, especially vegetables. Studies show that adding avocado to plant-based meals allows for up to 6 times as much nutrient absorption! Avocados, often called “alligator pears”, have a tough, thick outer skin that protects it from the elements. This means that there is little need to spray them with pesticides, and the chemicals that do touch it don’t affect the fruit within. This is good news for health-conscious individuals worried about the effects that chemicals and pesticides could have. It’s proven that adding avocado to an already healthy diet helps lower LDL (bad) cholesterol levels, while raising HDL (good) cholesterol levels. This is even more good news for your heart, as this lowers your risk of heart disease and stroke, as well as spares your arteries from clogging. Your first thought might not be to apply avocado to your skin, but topical application has its benefits as well. Many people use avocado as a moisturizer for not only skin, but hair as well. “Alligator pears” are a popular ingredient in face and hair masks, and even as lotion. Be careful, though! Avocado is known for spoiling rather quickly, and turning smelly and brown. It’s better used as a one-time use beauty product.